Blaise thinks it’s time to make a get away. See his recommendation on how to escape Laurent and the thugs on Page 18 of Chapter 5. 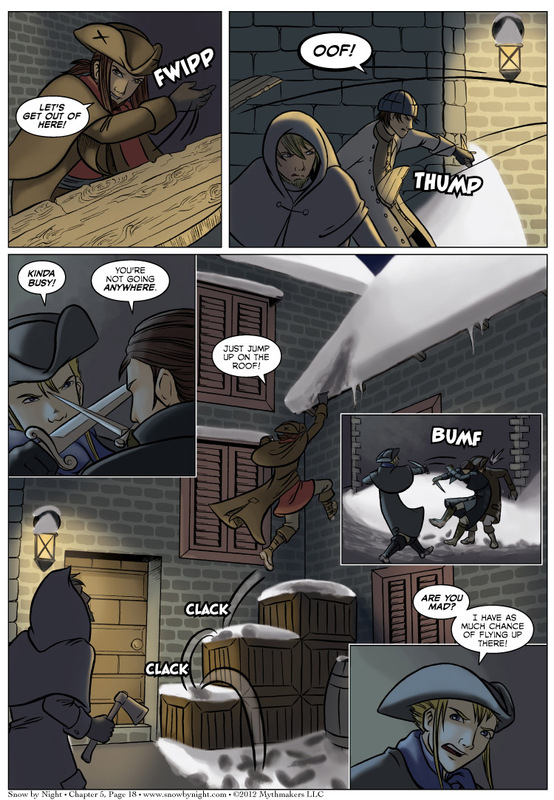 To see Brittany’s pencils for this page, please vote for Snow by Night on Top Web Comics. Oh, we graduated off the wait list for Katsucon and will be attending the convention in February. This is the largest anime convention in the DC metropolitan area. We were there last year and had a great time. Also, our good friends over at Tamuran have an Indiegogo (it’s like Kickstarter) campaign. Help support indie comics! Especially the incredibly talented art and storytelling of Eren and Chezhnian. Actually, that SFX was inspired by Tellos, but it does come across as Super Mario-ey. Maybe I’ll change the Sprongs to Clacks.